In yet another example of "off the wall" market timing theories, academics Ilia D. Dichev and Troy D. Janes have postulated that returns in the 15 days around new moon dates are about double the returns in the 15 days around full moon dates. A similar result was reported by Lu Zheng in the paper "Are Investors Moonstruck? 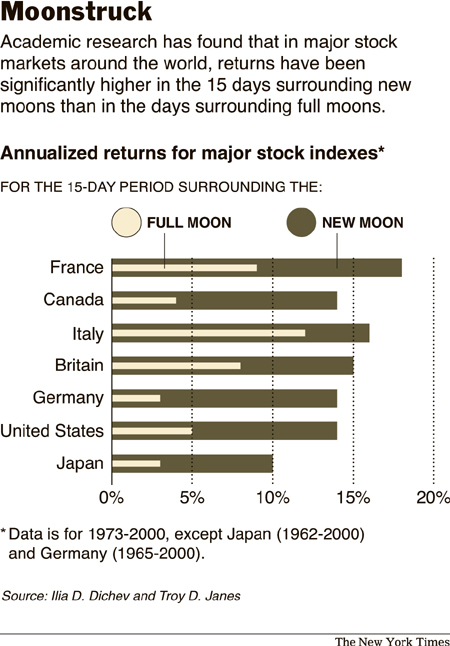 Lunar Phases and Stock Returns" which showed that stock returns are lower on the days around a full moon than on the days around a new moon - the magnitude of the return difference is 3% to 5% per annum. As is often the case in such academic studies, there is little likelihood of creating a profitable active trading strategy out of this information due to the cost of trading 13 times a year compared to the magnitude of expected outperformance (3-5% pa). However, it may be worth bearing the lunar calendar in mind when you are thinking about buying or selling shares in your portfolio, provided that there is no urgency in completing the trade. If you are routinely adding to your portfolio in the week immediately before or after the full moon, and selling within a week of the new moon adds 3-5% to your overall returns (pa?) it could be a worthwhile strategy.